I write a lot about taxes because taxes and investing go hand-in-hand. If you manage your taxes well, you get to keep more of the gains from your investments. There are many ways to minimize one’s taxes while investing. Contributing the maximum to all tax-advantaged accounts would be the most obvious. In a recent E*TRADE StreetWise survey, 45% of respondents said they believe investing in tax-advantaged accounts such as 401(k), 403(b), IRA, and HSA is effective for limiting the amount of taxes they pay. That number is way too low. As I wrote in Traditional > Roth > Taxable, the taxable account comes last. In addition to the tax deduction or tax free withdrawals, you won’t have to worry about accounting for dividends or capital gains while the money is inside a tax-advantaged account. That alone eliminates many of the tax headaches in addition to shielding your dividends and capital gains from taxes. After you exhaust your tax-advantaged accounts, you venture into a more complicated world. You will have to learn many terms and strategies: cost basis, tax lots, capital gains and losses, realized vs unrealized, short-term vs long-term, tax loss harvesting, wash sale, taxable vs tax-exempt income, tax efficiency of mutual funds and ETFs, and so on. It’s a lot, but it’s essential knowledge for an educated investor. Some brokers offer good education materials to their customers and the general public. 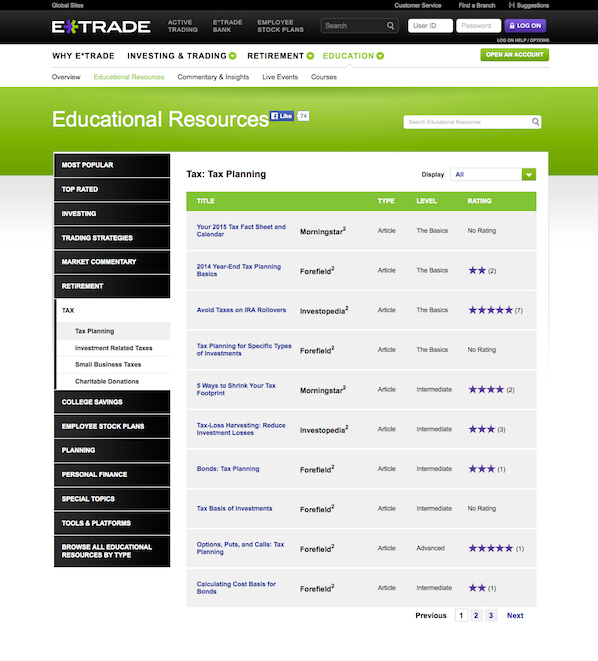 If you go to the E*TRADE Education Center you will see articles, videos, and courses from reputable third-party sources such as Morningstar and Investopedia. The materials are categorized into different topics and levels, from the basics to intermediate to advanced. These educational resources are open to all investors, whether you are an E*TRADE customer or not. My employer uses E*TRADE for its Employee Share Purchase Program (ESPP). The IRS made changes to how the cost basis is reported for shares bought under an ESPP starting in the 2014 tax year. E*TRADE sent me a heads-up e-mail as early as in November 2014. That’s how I knew I needed to adjust the cost basis reported on the 1099-B form. 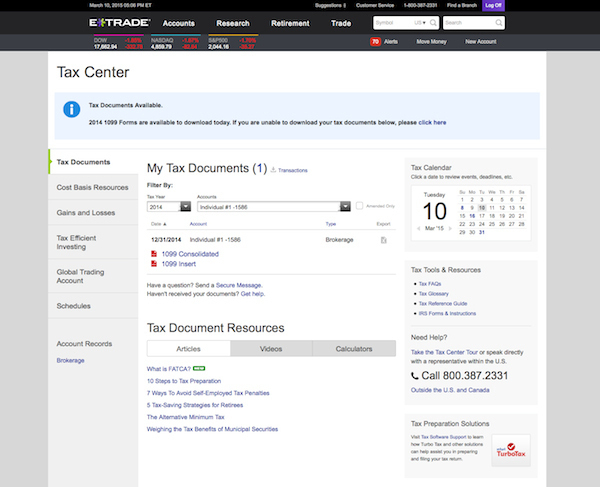 As an E*TRADE customer, I have access to E*TRADE’s Tax Center. Not only am I able to download the 1099 forms, I also have access to supplemental data which provide further details on what made up the numbers on the 1099 forms. E*TRADE did an especially good job in showing how the cost basis should be adjusted for each ESPP sale. The IRS mandated that brokers must report only the acquisition cost on the 1099-B form, which is incorrect and understated. E*TRADE shows the necessary adjustment in its Tax Center, not just in generic terms, but in actual dollars and cents for each sale. That made my life much easier. I reported a non-deductible traditional IRA contribution for year 2014. The contribution was originally to Roth IRA but then recharacterized to traditional IRA in 2015 due to tax filing status change (from married filing jointly to married filing separately in order to lower student loan payment). Q1 for year 2014 contribution – If I do the backdoor Roth IRA conversion for the 2014 contribution, I believe the only taxable amount would be the earnings and the original contribution amount is not taxable, correct? Q2 for year 2014 contribution – There shouldn’t be any penalty charge for early withdraw, right? Q3 for year 2014 contribution – I don’t need to amend my 2014 tax return if I do the backdoor Roth IRA in 2015 for 2014 contribution, correct? I made a contribution to Roth IRA in January 2015 (didn’t know that I am not eligible to contribute to Roth IRA at the time) but then recharacterized to traditional IRA the month after as the tax filing status for 2015 will still be “married filing separately”. Q1 for year 2015 contribution – If my 2015 contribution take the following route: from Roth IRA à (recharazation) à Traditional IRA à (Backdoor Roth IRA) à Roth IRA. Is it still okay to do Backdoor Roth IRA in this situation? Q2 for year 2015 contribution – Will I be able to file “married filing separately” if I do a backdoor Roth IRA for 2015 contribution? Q3 for year 2015 contribution – Is the earning the only taxable portion and the original contribution amount is not taxable? Q4 for year 2014 contribution – There shouldn’t be any penalty charge for early withdraw, right? Q5 for year 2015 contribution – If I do the backdoor Roth IRA, is it better to covert both 2014 and 2015 contributions at the same time or separate (my Traditional IRA only have these two years’ contributions so far) in order to file tax in “married filing separately”? Should I wait until 2016 to do the backdoor Roth IRA conversion for 2015 contribution in this situation? Q6 for year 2015 contribution – Besides the tax form 1040, is form 8606 the only other form needed to complete? Do I need to complete from 5329?